PS, I've watched several videos of how to sharpen. I'd advise practicing on something a bit larger than a knife so you can get a feel for what your doing. Machetes are great for that, and just as cheap as almost any knife. Also: everyone's preference of edge type and sharpness varies. You do what you need and whatever type of edge you want. Myself I have no issues whatsoever with a convex secondary bevel which is what I put on the swords I do sharpen myself. One thing of note as well: you'll most likely have to polish part of the blade because of grinding marks or scratches. No biggie, wet-n-dry sandpaper and some oil/polishing paste and lots of elbow grease will make that blade shine (or not, if you like munitions grade like me). If the scratches are deep/bad, start with 400 grit and work your way up, making sure to polish along the length (from guard to tip, not middle to edge) and move along the grits to your desired level. Unfortunately I don't have any knives other than kitchen, and no machete. Thank you. I also plan on trying to get a machete. If you're near an outdoor store they sometimes stock cheap knives and cheap machetes. I can vouch for the cold steel machetes. Their cutlass machete is almost like a messer blade. Pretty addicting to cut with. Home improvement stores like Lowes, or similar places that sell gardening tools, will usually have some type of cheap machete. Jordan is correct in that CS makes a good machete, I have three. I don’t know the prices after importing where you are but might be worth the extra to have after you feel confident with your sander. Don’t sell machetes short, they are king in my country but rarely does one see other than a Latin style here. If you have no interest in a machete other than a learning tool is another thing. Regardless don’t buy one of those stainless steel Chinese things. 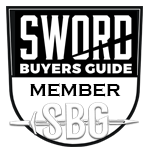 CS does an excellent machete that im my experience many times out performs my swords. The tactical katana machete, gladius, and cutlass machetes have excellent blades, yet terrible handles. Slice through targets like butter when properly sharpened. Knew someone who had one of those. Very bulky and not much blade for the price, at least in freedom dollars. Have you looked into tramontina machetes? Have not. The selection is pretty limited around here. I plan on just using it for sharpening practice. Do you canucks have amazon? There's a pretty decent selection on there, but I'm not sure how it is in Canada. For sharpening practice I'd go for a longer double edged blade, maybe the CD gladius? Trying to think of things that are cheap but somewhat resemble medieval stuff. Better practice for tip sharpening than something like a single edge blade. We do have Amazon. Is that machete I posted the link to a single edge? Single edge sawback and about a 10 inch blade. The knives are all stainless steel. Looks like I may have to just start out on the VA KT. I wonder what the best angle would be for it. I know the recommended general angle is 15 - 20 degrees (one side).